As old as the century, this two-story Victorian home has been carefully restored in decorated in period style. You'll admire the antique furniture and the lovely floral wallpapers. In the winter, guests cluster around the wood-burning stove. Cindy's full breakfast specialties include blueberry pancakes and homemade breads & muffins. 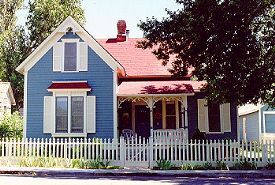 This and other Arizon Bed and Breakfast Inns can be found here in The Register.